This encompasses all previous questions. I decided I didn't want to say this more than once, and I've changed my stance a bit. For the most part it's unix vs windows. IIRC Windows uses threads where unix forks. This means that Settings for servers like Apache may vary in some settings, and even in the way it should be compiled. This also means that Languages like Perl have to work differently on Windows. Firefox has its preferences menu in a different place on Unix, so who's to say that Something as generic as a browser isn't a valid *nix question. Firefox was *nix first really. I can install a great number of apps that are primarily *nix on windows now, does this mean we shouldn't allow questions about them here? I think the separatism needs to die, this site isn't about what should be on SO,SF,SU vs what should be on Unix SE. This site, like those, is about helping each other with our problems. Sure this may not be the best place to ask about Apache, but I think I'd rather tell the person "you'd get faster answers on SF" than I would saying it's off-topic. Apache works fine on Unix, just don't ask about IIS. Technically it might even be ok to ask about windows apps, we have Wine (and derivatives) right? So long as your question is about running them in wine (or some other way related to *nix). We don't have to limit Unix to SUS (Single Unix Standard) I've asked plenty of KDE questions on here, and for those who don't know some of KDE works on windows. Ultimately the point I'm trying to make is that the lines are blurry, let's focus on users getting help as best and quickly as they can, which may mean recommending another site (or migrating questions once we can ), instead of arguing about whether something is or isn't Unix enough. When in doubt, it's Unix. as a non argumentative response to Michael, this following diagrams are a visual representation of what shapes my opinion. Although I at first generally agreed with his opinion I realized that there's a certain problem with it on scale. 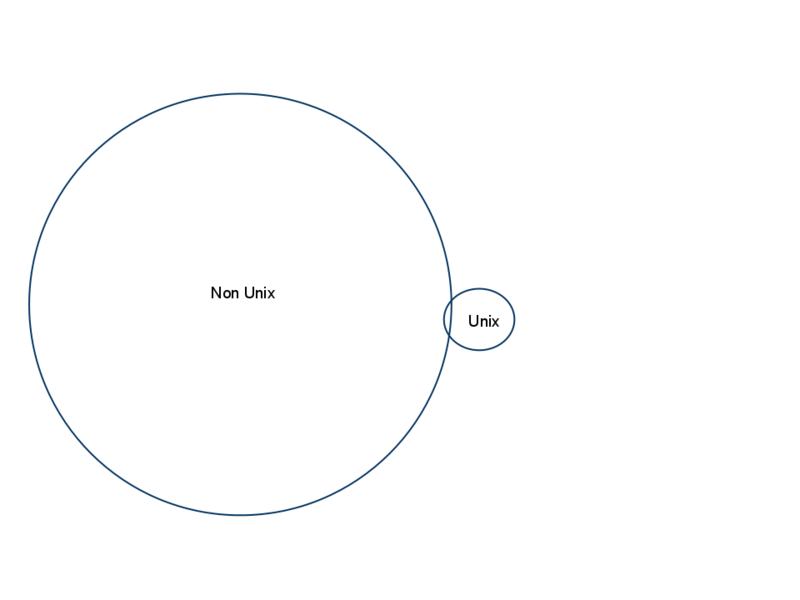 The following Image is a figure representing Non-Unix and Unix circa 2000 Maybe, as you can see, lot's of Non-Unix (windows) and not a whole lot of overlap. This is not based on any real statistics and was POOMA. You'll notice that what is pure unix hasn't grown much, but now there's a lot more overlap and a lot of growth. This comes from many apps not being cross-platform. Back then QT was Unix only (I think) now it works on every platform under the sun, Perl's windows implementation was quite different from the unix version, now we have Strawberry. Zsh runs on windows, MSysGit is coming along nicely, VLC and MPlayer (+ gstreamer) are everywhere, Firefox is the #2 browser and runs on all platforms, I've even used Konversation as an IRC client on windows. I would like to see our circle continue to grow, and in many ways I think the less differences is a good thing. I also think that the fact that we've been having this opinion that we won't help with resources that also work on windows could be some of why Ubuntu SE wanted its own community, although I haven't done any research to back this up, I'd be they have no problems with helping a Ubuntu user back up his firefox bookmarks, though they might say take the details of using XMarks to (webapps). In order for our circle to grow we must be willing to come out of our Ivory Towers to help the unwashed masses on the path to enlightenment. This is not to say we will not migrate questions elsewhere once that becomes possible, it's about helping users after all. If their question is better answered on SO (etc) then we should migrate it there, but I'm not going to try to figure out if questions are 'unix enough' anymore, best simply to suggest that something is better asked elsewhere ( like this ruby question ) than to get in a debate about whether that tool is unix or not. I'm more interested in seeing that user get help. As far as Ubuntu though... Many of those users wanted a separate community, I would see any effort to migrate questions to ubuntu SE or from ubuntu SE as an abuse of users that chose specifically to post in one community or the other. I really like how xenoterracide presented this, particularly putting the focus on who is the user of Unix Stack Exchange. After all, the identity of this site's target users is the question that the first statement of the site faq is answering. The second question asked of new site proposals on Area 51 is "who is this site for" but I think it is the most important. The only way these sites work is if you have people willing to participate on them, in particular the people who are willing and able to write answers. From my point of view, a Q&A site like this sets a boundary around its topic because it helps to make the people who answer questions happy. If a question is something most of the Unix experts frequenting the site wouldn't mind writing an answer to, it's probably on topic. And, from the question side, the site definition needs to make it relatively simple to determine if the question is on topic. I think that xenoterracide statement to "focus on users getting help as best and as quickly as they can" accomplishes that very well. I use a computer that runs on Linux, I'd like to think that when there is something I don't understand about it this is a place I'm able to bring my questions. The problem with the middle section is it allows endless amounts of questions that have almost nothing to do with *nix. Robert's example question is a good one here: "How do I back up my bookmarks in Firefox?" I would think that doesn't belong here, because backing up bookmarks in Firefox has nothing to do with Linux, even if you happen to be running Firefox on a Linux system. If I were looking for the answer to such a question, I would check SU. Are questions about vi, vim, and other clones on-topic here? Is it On or Off Topic When Unix/Linux is Only Ancillary to the Question? Are Skype questions off topic? Are android questions on topic? Is it ok to ask bash language questions? Are there objections to hosting the UNIX SE on a Windows platform? Is there a problem that Ask Ubuntu has migration paths to us? Is there a way to ask this that is not off-topic?